A beautiful scene of the Mediterranean harbor beholds us in this tapestry "Harbor at Last Light". 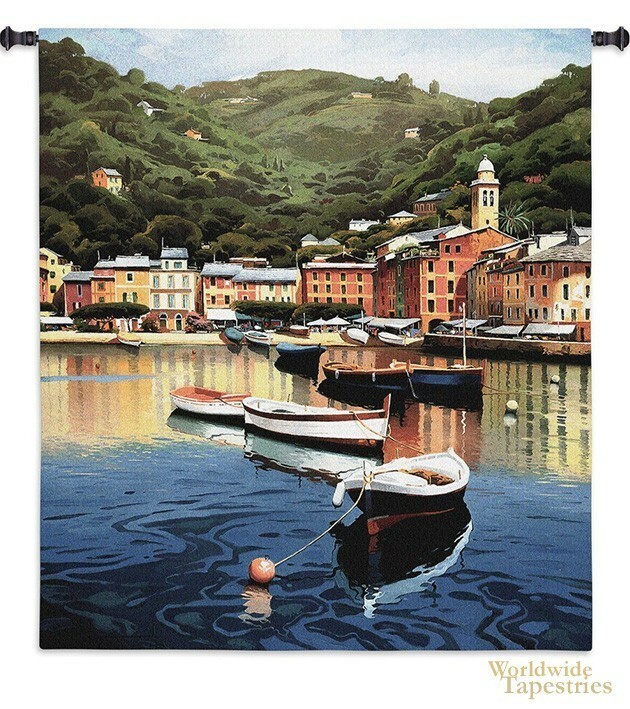 In this tapestry, the eye is lead from the green abundant hills beyond to the magnificent orange and golden village on the harbor to the boats on the rippling water. This is a work by contemporary artist Ramon Pujol. His works specialises in harbors from around the world, each with their unique feel and characteristics. A snapshot in time and place, this nautical portside scene from a harbor in the Tuscan Mediterranean captured in the late afternoon light captures the beauty and essence of this place. This tapestry is backed with a lining and a tunnel for easy hanging. Note: tapestry rod and tassels, where pictured, are purchased separately. Dimensions: W 50" x H 53"